With new Little League rules now allowing NELL to teach Tee-Ball to boys and girls turning four years old in 2015, and at the other end of NELL's mission to teach youth baseball, new league play for 13 year year olds on our Field of Dreams, NELL needs to add more covered areas to protect players against lightning during rain delays. Please contribute to NELL’s “Safe-At-Home” campaign to fund the costs of a new lightning protection pavilion between Fields 3 and Field 4. NELL boys & girls, ages 4 to 13, come to NELL to play baseball. They also lean teamwork, leadership and how win or lose, to always do your best − character traits we know help children grow to understand the importance of fair play. the cost to build our Safe-At-Home lightning protection pavilion. Of the Newtown Edgmont community! please contribute while sharing some of your NELL memories with us. The amount of your contribution will NOT be highlighted but NELL WILL BE listing every contributor’s name within a large advertisement in the County Press to let our community know how past and current members of NELL, and local businesses and organizations all came together and succeeded in reaching our $20,000 goal to build our pavilion which will keep our players safe from lightning while playing baseball at NELL. at this time to keep players Safe-At-Home at the Jack Daly Baseball Complex of NELL where you are always welcome. Former NELL Members unable to donate? Please still tell us your years and memories of NELL. 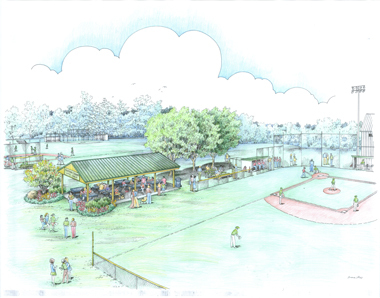 We are now at the halfway point of NELL’s “Safe-At-Home” campaign to raise the funds required to build our lighting protection pavilion at NELL on the footprint of the batting cage formerly located between Fields 3 and 4. Look for news in the coming days about the final stage of our fundraising campaign which offers a great benefit for the remaining 44% (133 NELL Families) who have not yet made their Safe-At-Home campaign contribution of the requested minimum $20 contribution which the NELL Board has requested from 100% of all NELL Families. Special thanks to the 56% of all NELL Families (170 Families) which have already made their contribution during the first half of our campaign. Many of you donated more than the $20 contribution donation by midnight last night and regardless of your contribution amount became eligible to win one of 20 prizes with a total value of more than $1,500. I am happy to inform all 20 Prize winners, and the entire NELL Community, of the names of our prize winners whose prizes will be sent to them in the mail tomorrow and should be received at the address used in making their donation in a few days. Remember, if you are one of the remaining 133 NELL Families who have not yet been able to go online to make your contribution through the NELLBaseball.com/safe-at-home web site, a new exciting opportunity for your contribution will be announced in the coming days. PLUS $25 in NELL Snack Bar Bucks. Congratulations, the total value prize award value of $1,000! PLUS $50 in NELL Snack Bar Bucks. Congratulations, the total value of your prize award is $300! Congratulations, the total value of your prize award is $150! Congratulations to our 20 prize winners who prizes will be sent by mail to the address used for your donation and should be received in the next several days. A special thanks to the 170 NELL Families which have already donated and important reminder to the 133 NELL families yet to make their contribution that if we want to see our new lightning protection pavilion built this spring we must all come together to Make It Happen!